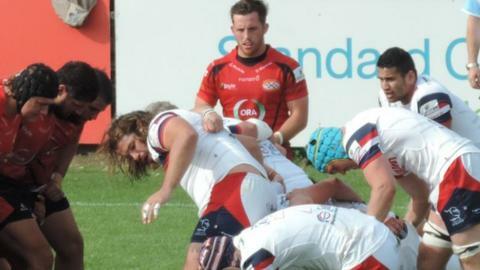 Jersey let slip a second-half lead for the second week in a row, as Doncaster Knights battled back to a 23-17 win at St Peter. Tries from skipper Ryan Hodson and full-back Tommy Bell gave the hosts the lead before second-row Matt Challinor closed the gap to 10-8 at the break. Jack Burroughs went over for Jersey's third try early in the second half. But five successful penalties from Doncaster wing Dougie Flockhart saw them fight back for the win. Jersey back Mark McCrea thought he had broken free to score a potentially match-winning try in the closing moments, but referee Darren Gamage had already blown his whistle for crossing. The islanders had gone into the game on the back of on the opening weekend of the Championship season, when they had led 19-3 early in the second period. Jersey started brightly back on home turf though, with Hodson crashing over from the maul following a well-worked line-out inside the first three minutes. Bell's try extended the advantage but Knights hit back when Challinor used his power to ground the ball despite last ditch tackles from Mick Noone and Bell. The hosts started the second-half in a similar manner to the first, with a try just minutes after the restart. Burroughs, playing on the wing instead of his more familiar full-back position, finished off the move after Bell's grubber-kick down the right was not properly dealt with. Jersey had laid the foundations for their first win of the new campaign, but Doncaster had other ideas. In strong wind, Flockhart found his range and as the penalty count rose he superbly slotted five kicks between the posts to pull his side from 17-8 down to 23-17 in front. With time running out the Channel Islanders pushed for a fourth try and replacement McCrea thought he was going to stride in for an easy score before the referee ruled there had been an obstruction in the build-up. Jersey take a losing bonus-point from the game while the visitors can celebrate back-to-back wins on their return to the Championship. Jersey: Bell; Foster, Locke, Robling, Burroughs; Bentley, Glynn; Lockwood, Garcia-Veiga, Williams; Phillips, Markham; Maidment, Hodson (capt), Noone. Replacements: Lancuba, Harris, Herriott, Rae, Kaho, Griffiths, McCrea. Doncaster Knights: Jarvis; Flockhart, Clark, Armitage, Lewis; Lennard, Palu; List, Hunter, Quigley; Challinor, Hotson; Makaafi, Hills (capt), Shaw. Replacements: T. Davies, Bergmanas, R. Davies, Phelan, Bravo, Roberts, Bulumakau.